Greetings from Health for Haiti! At the request of the community in Grande Saline we recently expanded two of our most successful education programs. Computer classes with Mr. Eric remain one of the most popular offerings at the school in Grande Saline. 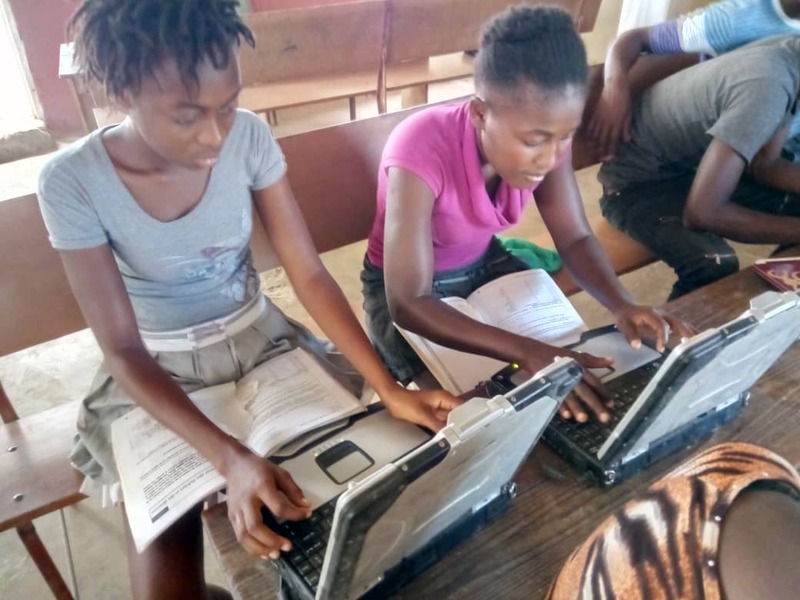 With donated/refurbished laptops and content created by SUNY Broome students who are part of the SUNY Broome Bridge to Haiti project, the students in Grande Saline are learning essential computer literacy skills that are critical for communication and success in today’s world. The children have been so positive about their experience in computer class that the adults in the community asked whether there could be a class offered on the weekends for them. Thanks to our generous donors and Mr. Eric, the new class for adults is going strong. These days in Grande Saline it is not just the school children who are gaining critical new digital literacy skills! The community is proud of this great resource that is available to both children and adults. Our popular weekend sewing program was also recently expanded. Health for Haiti helped the community to build cabinets to store the sewing machines and supplies. Now that the supplies are stored in one of the classrooms, the teachers are offering a sewing class to children while they are in school. The students are excited for the opportunity to learn this valuable skill. Thank you to the generous donors who have supported these educational opportunities for people of all ages in Grande Saline. SUNY Broome Health for Haiti is committed to investing in the people of this community, and we look forward to continuing to learn together! Once again our dear friends in Haiti are dealing with turmoil, chaos, and in some places, violence in the streets. 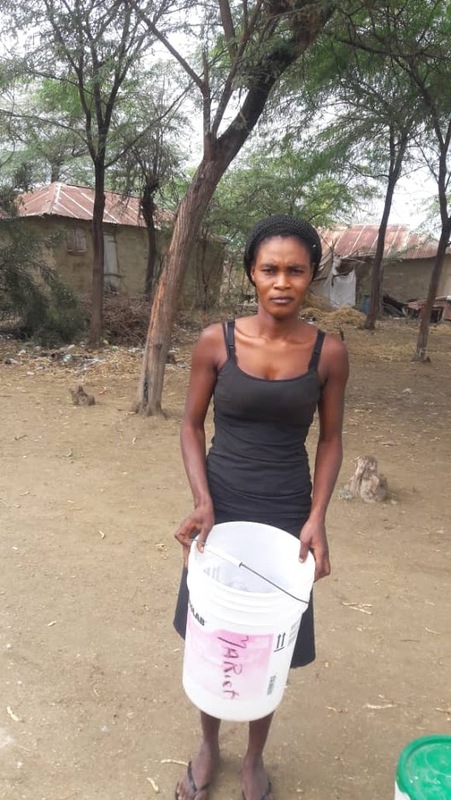 Frustration over poverty and poor living conditions are driving many people to protest against what they see as unfair economic and social policies. As always, the situation in Haiti is complex. What is clear is that it is the working people who suffer most in a crisis like this. Schools and stores are closed. 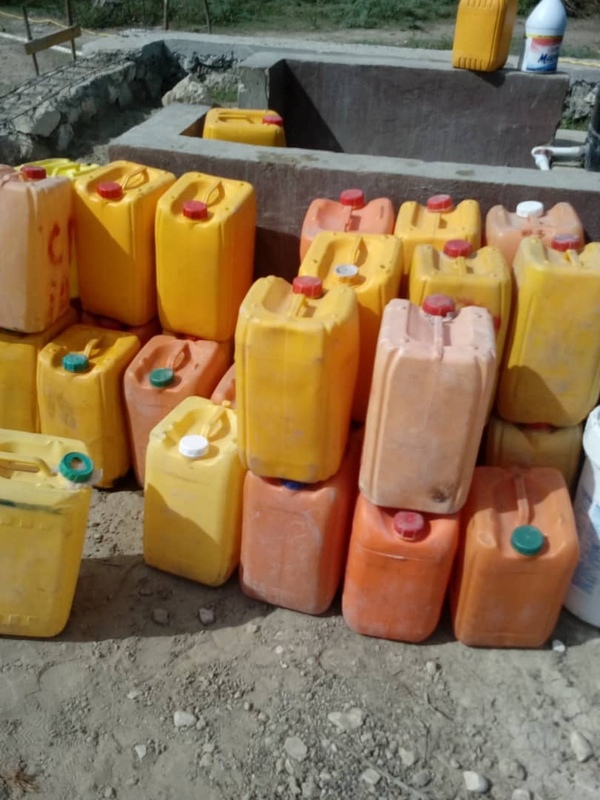 Many people are trapped at home and cannot safely leave to purchase food and other supplies that they need. It is always hard to see our friends in Haiti suffer through these difficult times. 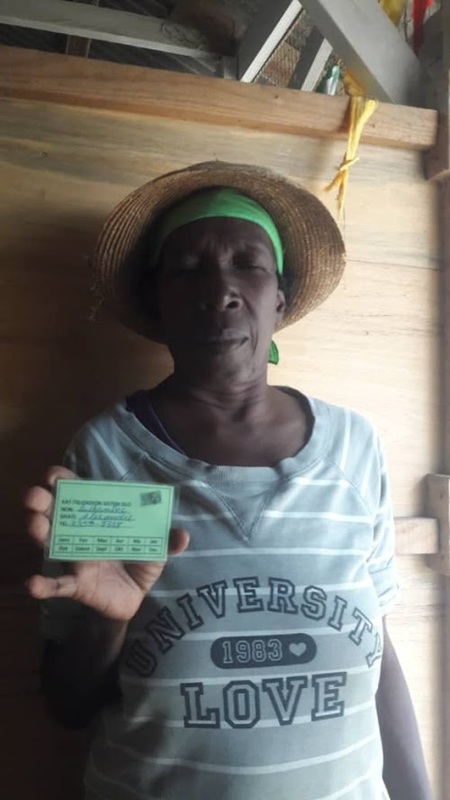 Health for Haiti continues to be in frequent contact with our partners in Haiti and we will do what we can to help by continuing to support health and economic initiatives. We also remain committed to supporting local businesses in Haiti. The businesses provide jobs and economic stability for communities. Thanks to the many people who have been following the news and asked about the communities we serve in Haiti. In rural Grande Saline, the people are not as impacted by the demonstrations that are taking place in the bigger cities. So here we can focus on the positive progress that we are continuing to see in the Grande Saline community. School is open and functioning well. Below are some pictures from classes in Grande Saline this morning. The children are excited to be in school learning and we hope that the education they receive will help them to bring a new era of peace and prosperity to Haiti. 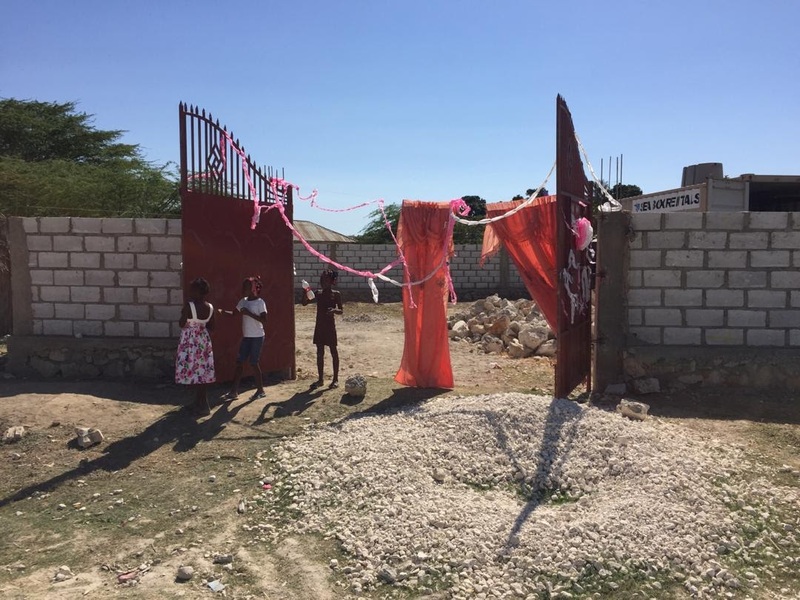 Supporting the school and educational opportunities in Grande Saline is one way we can help to bring a better future for Haiti. In January, Pastor Berlando said that our support of the school was like planting seeds for the future of Haiti. He thanks Health for Haiti for investing in these children. The garden also continues to thrive. The pepper and tomato plants are growing in the student garden and the big garden. It is always nice to see the blue sky and green plants in Haiti, especially when you are dealing with February in upstate New York! This week the gardens were weeded and we are hopeful that the plants will continue to grow. Success in these gardens will mean better nutrition for the children and families in Grande Saline. Thanks to the farmers, community members, and students who work so hard in these gardens. The wall around the water filtration system is nearly finished! The spaces have been filled in and the gates are ready to be installed. 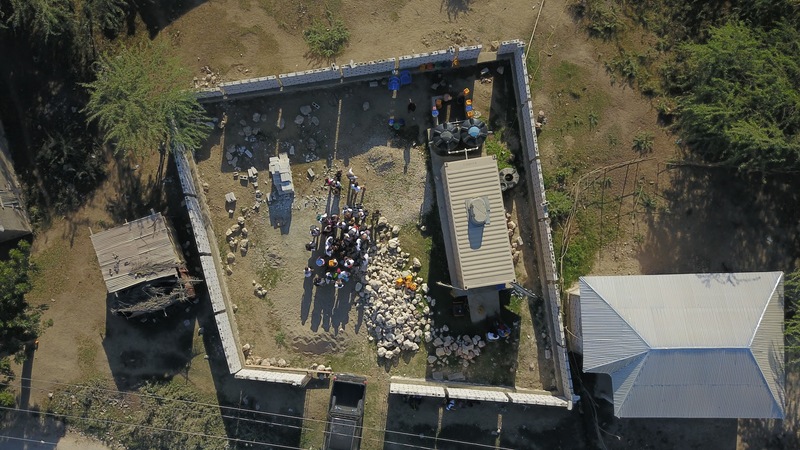 Many thanks to the Endwell and Binghamton Rotary Clubs and Rotary International for helping to fund the wall project. 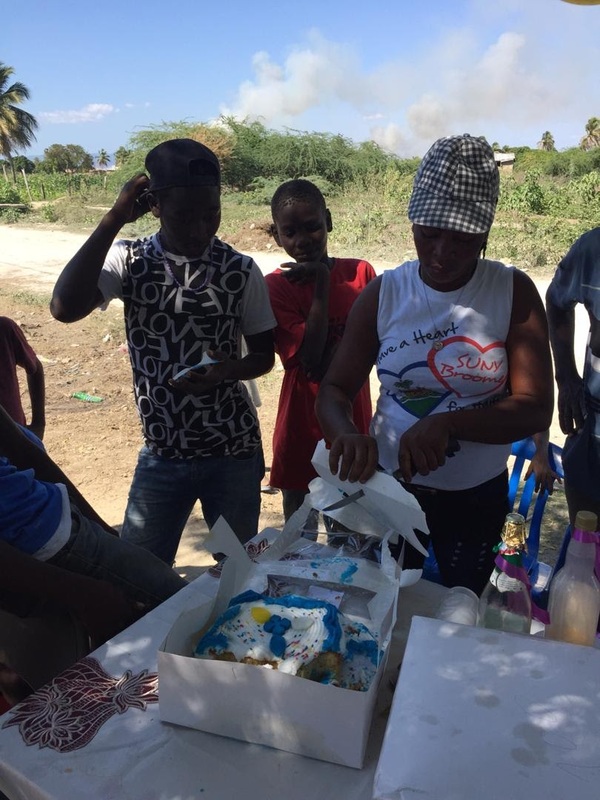 Next month Health for Haiti and the community in Grande Saline will celebrate four years of clean drinking water in Grande Saline. We are looking forward to working on the next phase of our project to help the community convert the system from gas to solar power. 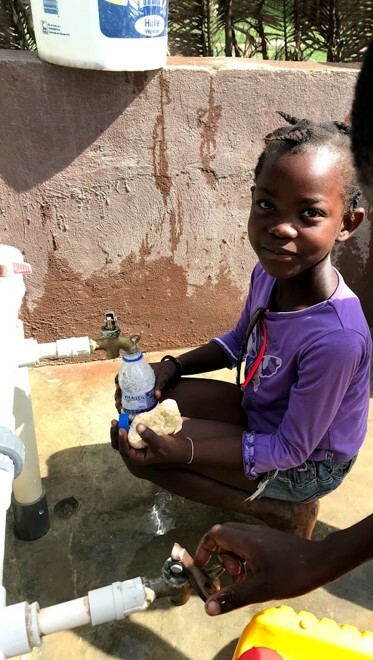 There is no doubt that clean, safe drinking water has changed lives in this community. Thank you to the Health for Haiti community, students, and project partners. The people of Haiti have many challenges to overcome, but there are signs of positive progress that are hopeful reminders of what can be achieved when we work together. Greetings from Haiti! Today was our last full day in Haiti and we spent most of it at the beach (well, actually we spent most of it on the bus). After breakfast we prepared the toys and lunch we had for the kids from OAEH who were coming to the beach with us. Unfortunately our bus was over an hour late because it had a mechanical issue. Our driver, Steevenson, arranged for another bus to come and pick us up. After we and our supplies were loaded up we still had a couple of stops to make on the way to the beach. We needed to pick up the kids and staff who were coming with us to the beach and to get some ice for our cooler. After that, our “new” bus overheated. A few times. And we had about 75 people on the bus. So we were overheating too. Somehow we made it to the beach and could relax and have some fun. Everyone changed into their swimming clothes and then we gave the kids lunch. They had sandwiches, chips, cookies and juice. There was a goat nearby who really liked Pringles potato chips. I am pretty sure the goat would have really liked anything even remotely edible. After eating the kids went into the water and had fun swimming and playing and looking for shells. They were so cute and seemed to have a wonderful time. There were lots of smiles to see today. We spent a few hours enjoying the beautiful setting and everyone had some well deserved rest and relaxation! When it was time to leave we took a group photo with the awesome drone Silvia brought and loaded into the bus for the ride home. The ride home was pretty uneventful compared to the ride to the beach. Marcia brought some percussion instruments and there was a lot of drumming and cow bell and singing on the ride home. We had another stellar dinner at Jude’s and then many of the students enjoyed a roof top Zumba session and some games and conversation. It has been a very productive and rewarding week for us. The dental team sealed over one thousand teeth, the medical team saw hundreds of patients, the education team taught science and art lessons to over five hundred children and provided two days of professional development to the teachers in Grande Saline. In addition to our service work, we made some special friendships and developed a better understanding of the Haitian people and culture. This is a fantastic team of students and staff and translators and it has been a pleasure to work and learn together. Thanks to everyone here and at home who made this trip possible. Tomorrow we will travel back to New York and readjust to the cold weather. Next Tuesday we will meet for our final class when the students will deliver presentations about their experiences and reflect on what their time in Haiti meant to them. It is always hard to say good bye but I think everyone is looking forward to returning home. After we are home, I am sure all of us will miss much more than just the Haiti sunshine. Haiti is special, there is no place quite like it. Greetings from Haiti! Today was our final official work day in Haiti. After breakfast we went to Damabiah Orphanage where we planned to hold our last medical/dental clinic and education program. There are 612 children who attend school at Damabiah and 87 orphaned children who live there. As soon as we arrived our team split up and worked on unpacking our supplies and setting up. The medical team saw 104 patients. The dental team saw 65 patients, applied 65 fluoride varnishes, and sealed 599 teeth! 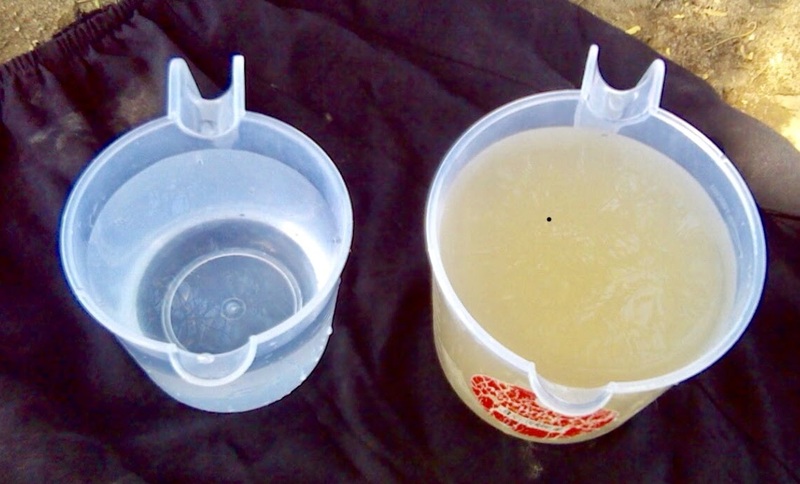 After seeing the children, our dental team also cleaned the interpreters teeth. The education team served over 300 children with our lessons on the skeleton, the heart, art, insects/scientific illustration, and physical education (basketball). We had so much fun working with all of the children. We also provided and served lunch for the kids and left them SUNY Broome bags, flip-flops and some other small gifts and supplies. We had a great time playing with the children after we finished working and it was sad to say goodbye to our new friends. When we returned to the guest house several of the students and staff worked really hard to reorganize and repack our 45 suitcases so we would be prepared to return home on Friday. We had Jude’s delicious grilled chicken for dinner and then many of the students made sandwiches for our trip to the beach tomorrow. We are taking 25 kids from OAEH for a fun day of swimming and playing. We made our traditional raw hot dog, mayo and ketchup on white bread sandwiches and, thanks to Schneider and Roosevelt, packed up cookies, chips and drinks for all of the kids. We also have some beach toys for them to play with. It will be our final full day in Haiti and we are all looking forward to some fun in the Haiti sun. We look forward to having some fun together after all of our hard work on this trip. Below are several pictures from our day. Thanks again to Marcia and Silvia for sharing their photos. Good night from Haiti! Greetings from Haiti! Today started with another roof top yoga class from Kristy. It finished just as the sun was coming up (I guess Kristy was late to class on purpose). We all enjoyed a breakfast of Jude’s amazing oatmeal and had a more relaxed morning as we did not have to leave the guest house until 9:30. Our first stop this morning was at the Musée du Panthéon National Haïtien (MUPANAH). MUPANAH is a museum featuring the heroes of the independence of Haiti as well as Haitian history and culture. Since our team is so large, we divided into two groups to tour the museum. Our tour guides were very knowledgeable and did a great job explaining the extensive and complex history of Haiti. We learned about the tumultuous and often brutal road to independence experienced by the Haitian people. We had the chance to view some artifacts of Haitian culture that helped to make the history come alive for us. I think our experience at the museum helped us to have a deeper understanding of the resiliency and pride of the Haitian people. Of course a major goal of our trip is service work, but this is a college course not a mission trip and Professor Hankin and I were glad to have such experienced and talented guides to contribute to the academic component of our experience. After the museum we went back to the guest house for a couple of hours. We were surprised to see that the road in front of the guest house was being paved!! It is great to see some real improvements happening around Port au Prince. Later in the afternoon we went to Mother Teresa’s Children’s Hospital. We spent a couple of hours holding, feeding and playing with sick babies and children. We also helped the staff to put away the Christmas decorations. Some of the students described the experience as painful but rewarding, and definitely eye-opening. There were so many children there, and while it was a pleasure to hold them and play with them, it was very hard to leave them when our visit was over. There were quite a few tears, and not just from the children. This was different from the other work we have been doing, we did not have to use any special skills our bring any equipment. Sharing some human contact was the most important thing we could do. After Mother Teresa’s we came back to the guest house and prepared for dinner. We also had some visitors today. Natasha’s family is originally from Haiti and she had a visit from two cousins she has never met before. We also had a visit from a local merchant who set up a bunch of souvenirs so that we could go shopping right inside the guest house. It was fun to look at all of the items and many of us made purchases. We were not allowed to take pictures inside MUPANAH or Mother Teresa’s so there are not too many photos to share today, but thanks to Marcia and Silvia there are some images from other parts of our day. While we were at the museum today, we learned about the motto on the Haitian flag: L’Union Fait La Force (Unity is Strength). It is also a good saying for our course because we are definitely stronger together. The cooperation of our students and interpreters and staff has enabled us to accomplish some great work over the past week. Tomorrow is another full clinic and education day at an orphanage in Port au Prince. It is our last official work day of the trip and we are all ready to give it our best. Good night from Haiti. Health for Haiti Meets OAEH! Greetings from Haiti! Today started with “Rooftop Yoga Club” of Jacob, Ty, Kat, Mikayla, Silvia, Claire, Jen and our teacher Kristy. We felt really good about ourselves until we saw the group at the guest house across the street running, doing calisthenics, and kick boxing on their roof. After everyone was up, we all had a great breakfast of eggs, watermelon, mango, bread, peanut butter and jelly. We knew we would have a later departure than usual today because of the logistics of our day. We were working with children from Assistante pour des Enfants d’Haiti (OAEH) but we are not able to go to them, so we borrowed a church with an appropriate space in Port au Prince where we could work with them. Our bus driver Steevenson went to pick them up and 7 am, dropped them off at the church and then came to get us. Unfortunately he got a flat tire along the way and we had a bit of a delay while Steevenson changed the tire. After that we loaded our suitcases on the bus and headed out to meet our friends from OAEH. They gave us a very warm welcome and greeted us by singing a song. Some of it was even in English! After the introductions, we got to work setting up the medical/dental clinic and our education program. While some of us were setting up, a few students used the puppets to teach the kids about the best way to brush their teeth. Today in the clinic we had Molly, Jennie, Kat and Mikayla assisted by Min in dental. We had Sam, Amelia, Hollis, Nate, Aurora, Robert, Austin, and Natasha working in medical. They were assisted by Professor Hankin, Darlene, Kristy and our interpreters Louie, Roosevelt, Junior, Eddyson, and Wacnel. The medical team served over 65 patients. They saw 48 patients and applied 48 fluoride varnishes. They sealed 504 teeth! The sealants are only applied to permanent teeth and prevent future tooth decay. Our education team consisted of Jacob working with Tom and Greg on “Balloon Rocket Racers”, Mia and Riley working with Lynn at our bones lesson, Claire and Ty were back at the heart lesson, Sara, Abby and Marcia were working at the insects and malaria and scientific observation lesson, Isaac and Kaia were working outside on physical education, and Brooke and Emily were working on an art game and lesson. The “Balloon Rocket Racers”, the physical education equipment, and the art game were provided by students and teachers at Tioga Hills Elementary School in Vestal, New York. We had Elysee, Lyndie, Steevenson, Derson, Bury, Fritz and Jerry helping us to communicate. The kids rotated through the clinic and the education “stations” for a few hours and then we served them lunch. The lunch was purchased with the donation money that the Health for Haiti students raised before our trip. After lunch some of the OAEH kids treated us to a dance performance and we handed out some gifts we had brought for them. The kids were very well behaved and it was a pleasure to spend the day with them. Everyone pitched in and helped to clean up the church so we could leave it the way we found it! Steevenson brought the Health for Haiti group back to the guest house and then went back to take the OAEH kids back to their homes. Once we were back at the Guest House the students took some time to write in their journals and we all had some down time. Later on we enjoyed a dinner of salad, bread, rice and pumpkin soup. Everyone is tired after a busy but productive day. Jude put on the movie “Bohemian Rhapsody” to end our busy day. Everything was going on at once while we were working with the OAEH kids today so the photos are a bit of a jumble…but….we have a decent Internet signal so there are lots of pictures to enjoy. Thanks again to Marcia and Silvia for sharing their photos. And thanks to our entire team for all of their hard work!! Greetings from Haiti. Today we said goodbye to Saint Marc and traveled to Port au Prince. Some of us started our day with Kristy’s rooftop yoga which really helps to work out the kinks after all those hours on the bus! After that we enjoyed a delicious breakfast of pumpkin soup and got ready to go to church. One of the wonderful staff members at Le Gou T, Fabienne, invited us to attend a service at her church. We felt so welcome and enjoyed the beautiful music and singing. The Pastor even invited us to say a few words to the congregation. Professor Hankin talked about how the experience of seeing the people’s enthusiasm at the service taught us all about something special about the meaning of faith. After church we picked up our bags at Le Gou T and drove to Estinfil Guest House in Port au Prince. It was wonderful to see our friend Jude who is a fantastic host! Jude welcomed us to the Guest House and everyone enjoyed some well deserved rest and relaxation. Dinner was salad, plantains, rice, okra and beef. After dinner we had a team meeting and reflected a bit on our experiences so far. We have experienced so much in such a short time. Professor Hankin and I are proud of the entire team and grateful to our amazing staff who make this work possible. We want to give a special thanks to our driver Steevenson. He does such a great job getting us from place to place and keeping us safe.Below are some photos from our day (thanks to Marcia Blackburn and Silvia Briga for sharing). Tomorrow is another clinic and education day. We will be working with about 100 local children. Thanks for following and good night from Haiti!